Modern design preferences are usually stark, bold, and minimalistic. Most property owners want something that looks eye-catching and contributes to the environment of their home but also feels natural. At Ivy Studio, we’ve worked with clients who love the idea of natural hardscapes and boulderscaping. This form of landscaping design in Massachusetts is becoming very popular and for good reason. Artistically placed boulders and stones look grand and yet are completely natural and organic. 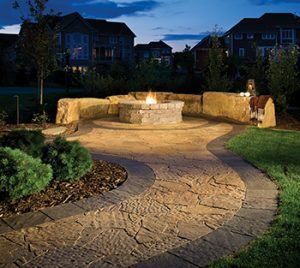 Our first step is to understand what you want from your landscape. Boulders can offer both form and function and a good landscaper would know how to use them to maximum effect. We’ll discuss the potential of your backyard landscape design and how boulders can be incorporated into the overall décor of the outdoors. Our next step is to understand what we are working with. The best boulderscapes look and feel natural as if they have always been there and you simply won the lottery with your property. We consider the natural topography of the area, the color of the stones and rocks already present on the land, and the architecture of your home. This will help us plan a boulderscape that would fit in well with your property. After we have all the information we need, we’ll create a few sketches of the layout of the stones and paint a picture of what the end result will look like. We try to make this as accurate as possible, but that’s not always possible. Boulders come in different shapes, sizes, and colors, so we don’t know for certain what the end result would be until we have actually seen the stones. Our landscapers usually improvise during the project and stack boulders in ideal locations based on their design sense. If you have any questions about our boulderscaping services or landscape design here at Ivy Studio, just give us a call at 781-591-0300 or send us a message using our contact form to tell us what you’re looking for.